You guys are too kind. Simon did all the hardest work, and Patrix all the hardest programming work. All I did was a little editing and tidying for easy digestion. Speaking of easy digestion, I will be presenting the TYCHOS at a science gathering next month thanks to the great efforts of our mutual friend Gopi who has arranged a "reinvigoration of science" meeting. If you could summarize your latest most exciting findings since the last iteration of the TYCHOS book, would you be so kind as to direct my attention to them? I am happy to summarize the work (in one of the brief times allotted to each presenter) however I would love to have new questions-and-answers that jump out at you as "critical" new additions. (Since it seems every week you have another answer to a question that was confusing the heliocentrists). I understand that we now have some sort of update on the P-type planets, but is there any more I should be aware of in case questions come up that you now have the answer to? Naturally, I'll be directing people mostly to tychos.info however maybe there is some new "solution" that is good for me to share understandings about. So happy to get a qualified question from someone not convinced it must be BS that I'm jumping the gun. Simon can fill in since he's the one doing the actual research. I'm coding Tychosium and following along on the first seat. In short the latest is that Tychosium demonstrates that Tycho Brahes configuration of the planets - all but Earth/Moon orbits the Sun, is the correct one. The ones in question was the outer p-planets. See Simons posts on this. Now we're working on Mercury. Simon has just confirmed that an oscillating orbit that changes it's tilt slightly from year to year will make observations match Tychosium perfectly and I'm working on building support for that in Tychosium. Next I think will be the first correct demonstration of our Moons movements - Newtons headache. Really? Have people shown they are convinced it's BS? I'm sorry. Then they obviously haven't tried to study or understand it . . . or the problems with the stars in the heliocentric system. The TYCHOS is obviously the more thorough and more physically correct option. We humans are often our own worst(/best) gatekeepers I suppose. If that's the one, then I will find time to study it properly before the science gathering. As for the Sun's moon Mercury needing an adjustment can you provide any more precise descriptive details about what this means? Just a small announcement that Simon has worked on the Moon movements the last weeks and made it correct against the existing observations and models (probably more correct than the currently existing solar system simulators). It's a strange feeling that these historical moments go by like this, but I'm sure it will be a bit more noticed in the future. Oh, and Simon is currently working on a post to document his process here on CF. 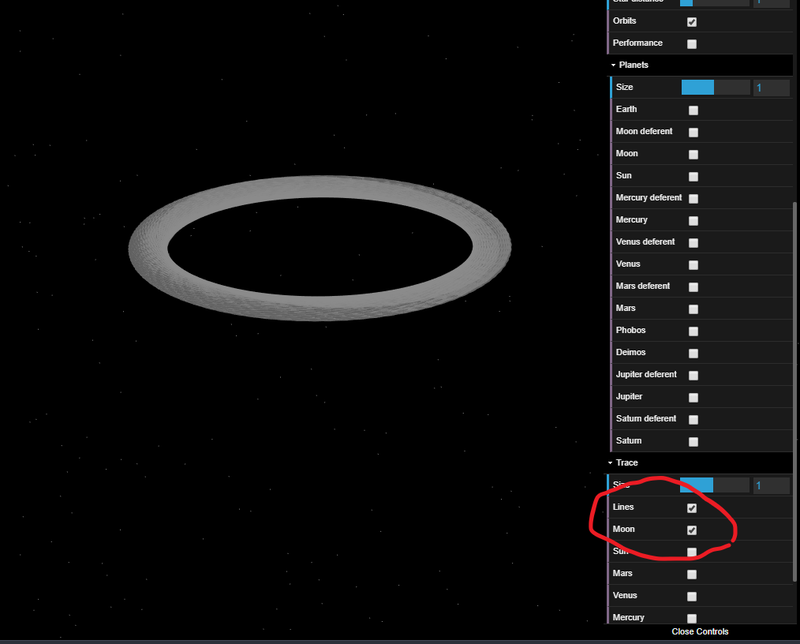 If you want to see some of the simple beauty of nature, set the speed in Tychosium to 1sec equals 1year and turn of all objects in the objects menu. Then check line under trace, and then check/uncheck Moon. See picture. Therefore, I hope no one will blame me for not explaining EXACTLY WHY the Moon moves the way it does. As I have often stated in previous writings, the TYCHOS model doesn't pretend to formulate a "TOE" (Theory of Everything"): however, at this point, I will confidently say that the TYCHOS model has already proved to be decidedly superior than the so-called Copernican model - insofar as its geometrical configuration has been shown to be far more consistent with empirical observation than the heliocentric theory - as "established" by Copernicus, Kepler, Newton, Einstein et al. Quite frankly, I didn't expect the TYCHOS model to go as far as demonstrating and depicting - graphically - the actual motions of our Moon, yet this is what the TYCHOSIUM 3D simulator (patiently elaborated by Patrik and yours truly) is able to do today. STEP1 : Set the speed of the simulator to "1 second = 1 year" (as shown below) - and start the Tychosium by checking the "RUN" box. You will now see our Moon's orbit performing its lovely precessional moondance - as it alternatively drifts from perigee to apogee (i.e. closer or further from Earth). A most astounding aspect of all this - is that the observed value of the oscillation of the Moon's perigee (closest to furthest perigee) is 14044 km*. Well, this "just happens" to be almost precisely the annual distance covered by Earth (14036 km) as stipulated in the TYCHOS model ! Moreover, the observed value of the mean / total oscillation of the Moon from perigee to apogee is 42108 km (which is exactly 3X 14036 km !). In my TYCHOS book - which was released more than a year ago - I submitted this (bold yet cautious) question: was Kepler perhaps wrong when he stated that all orbits are elliptical - and that all the celestial bodies (planets & moons) of our solar system "ACCELERATE or DECELERATE" as they find themselves closer or further from the Sun? Well, I have already fully disproved this latter Keplerian theory - by pointing out that Earth clearly appears to ACCELERATE (in relation to the Sun) between June and July, that is, at a time when Earth is furthest from the Sun*. Kepler's "laws" are therefore definitively falsified. *This fact is empirically proven by the analemma, i.e. the 8-shaped pattern that the Sun traces yearly in our skies. As for Kepler's idea of "elliptical" orbits, here's a quite conceptual (and slightly humorous) graphic of mine showing that our Moon's orbit needs not to be elliptical at all. You will have to imagine that bicycle wheel to be the Moon's orbit, while "God" wiggles his forefinger and makes the (tilted) bicycle wheel spin around. The pink section on the bicycle wheel represents a "heavier" part of the lunar globe which might cause the Moon's orbit to bob up and down by about 5° (just as we observe the Moon's orbit to be tilted in relation to the ecliptic). Of course, you'll also have to imagine Earth being located around the axis of the bicycle wheel. In any event, this doesn't mean that the shape of the bicycle wheel (i.e. the Moon's orbit) is elliptical ! (in the TYCHOSIUM, of course, the Moon's orbit is perfectly circular). The "N1" and "N2" dots are the famed nodes of the Moon's orbit which, of course, determine when a solar eclipse will occur. In these last weeks, in fact, I have worked at making these nodes coincide with the ACTUAL solar eclipses recorded over the centuries - with some pretty good success (see below). In the TYCHOS model, the orbital speed of Mars is shown to be uniform and constant since it always returns at (near-)equidistant* points of its “opposition ring”. Hence, those “elliptical orbits” and “accelerating / decelerating orbital speeds” (as promulgated by Kepler’s “Laws of planetary motion”) could well be illusory and may have to be revised, or possibly discarded altogether. Before Kepler’s laws came along, astronomers all over the world had been relentlessly pursuing the ideal concept of uniform circular motion. In fact so had Kepler himself before he started stretching and squeezing those recalcitrant Martian motions (observed by Tycho Brahe) in order to make them obey his ever-more-complex equations. [* Note: by "(near-)equidistant" I refer to how Mars returns to opposition in the TYCHOS at similar longitudinal separations - although of course always at different distances from Earth, as illustrated in my book - see the "Mars opposition ring" diagram]. So Kepler actually PREFERRED (the quite natural notion) that all orbits are perfectly circular! But what about Kepler's ultimate claim that "all orbits are elliptical"? Well, under the TYCHOS model, it is easily understood just WHY all planetary orbits surrounding us will APPEAR to be elliptical: since Earth moves very slowly (at about 1.6 km/h) around its PVP orbit, all our surrounding planets (and moons) will seem to move slightly faster or slower (against the "fixed" stars) depending on the direction of their motions in relation to Earth. Simple as that! In any case, dear friends, the TYCHOSIUM is slowly but surely becoming the most accurate digital simulator of our solar system. I have verified the solar eclipses since the 16th century - and all the way to those predicted for the 30th century (i.e. over a 1400-year-timespan) - and for now, they are remarkably precise (within about 1° or so *). You may actually verify this by yourselves by using the "Elongation" function in the TYCHOSIUM. More work is needed, for sure, (to achieve absolute accuracy) but consider this: if my working postulation that Earth travels at 1.6km/h were totally wrong, these solar eclipses would be "off" by many, many degrees (since Earth would move, in those 1400 years, by about 20 million km in the opposite direction of the Sun)! All in all, I am more than happy (in fact, happier than ever) with the TYCHOS model's consistency with empirically-verifiable reality. The verification of the Tychosium's accuracy goes on, day by day... and I hope that at least some of you will find it as exciting as I do ! So today I was wondering whether Mars (which of course is the "key planet" in the TYCHOS model - since it is deemed to be the binary companion of our Sun) could sustain an EXTREMELY LONG TERM verification of its orbital motion. Of course, there was never any guarantee (as I started this research more than half-a-decade ago) that my findings and computations - based on Tycho Brahe's masterful observations - would lead to the astounding accuracy which I am about to illustrate. Keep in mind that my main contribution to/ and correction of Tycho Brahe's work is what I like to call the "missing piece of the puzzle" of his proposed solar system model, i.e. 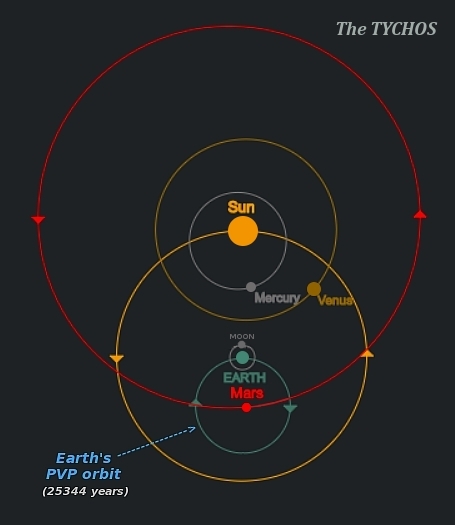 the PVP orbit, around which Earth proceeds "clockwise" (i.e. in the opposite direction of all of our solar system's bodies) at the tranquil speed of 1.6 km/h (or just about 1 mph) and thus accounting for the famed "precession of the equinoxes". Our quest to find the last time Mars and Earth was as close as it was in 2003 was off by 79 years. This has been corrected as stated above by a second computation. First to publish anything on this problem was Belgian author and mathematician Jean Meeus. He calculated that Mars has not been closer to Earth since the year 73,000 B.C.. However, Meeus based his initial calculations on the work of French astronomer Pierre Bretagnon and was off by more than 20,000 years. After Jean’s book was published, he contacted Italian mathematician Aldo Vitagliano (Naples University, Italy) and asked him to investigate the motion of Mars by numerical integration. Vitagliano reported back that the last time Mars was closer to Earth than during the 2003 opposition was on September 12 of the year 57,617 B.C. *. * Note that this date will actually correspond to September 2 (not 12) 57,617 B.C. - since 10 days were added to our calendar count back in the 16th century as the Gregorian reform was implemented so as to correct for / or at least mitigate the Julian calendar's increasing inaccuracy. Needless to say, if my computations of Earth's and /or Mars' orbital speeds and sizes were totally (or even only slightly) wrong, these two historical, super-close Mars passages / oppositions would certainly not match up in the TYCHOSIUM simulator. Absolutely amazing Simon. Happy Easter to you and everyone reading.